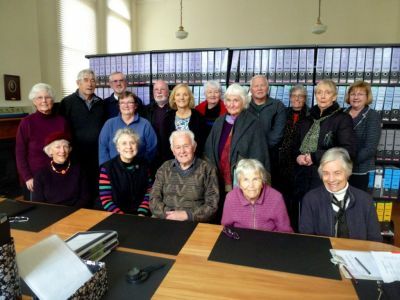 In March 2014 The Coromandel Heritage Trust officially opened a $1.1 million archive in Thames – part of The Treasury complex, a History and Family Research Centre for the Coromandel Hauraki region. This was the culmination of thirteen years of planning and fundraising by a very focused group, firstly as a steering committee, then as a Trust. It has been an ambitious undertaking for a small rural town, but with the region having such an early and interesting history, the Trust saw it as necessary, and of value to future generations. Just about everyone we speak to has some connection to this early part of New Zealand. The project had its beginnings with a group of ladies indexing at the Thames School of Mines for thirteen years. Most of these ladies belonged to genealogy groups and were aware of the importance of saving records. We continually got asked where in Thames people could go to find out about their early family. We also had boxes of material handed in by people who didn’t know what to do with it when they cleaned out their parents’ house. So we were getting quite a nice collection – in our homes. We approached the Mayor, Chris Lux, to see if there was a spare room we could use to house this material and make it available to researchers, but no luck. Over the next couple of years Chris thought about what we were doing, and talked to people about the importance of saving records, and he became very supportive of this project. Early in the Trust’s formation, Wallis Barnicoat from National Services Te Paerangi attended a meeting of the local museum cluster group (Heritage Hauraki Coromandel) at Whitianga. One of her suggestions was that we should all undertake National Services Te Paerangi’s New Zealand Museums Standards Scheme. I couldn’t see the use of this for the Trust given that we didn’t have a home at that stage. I emailed her saying just that, and got a reply pointing out that she thought it would be invaluable, would help with planning and that we might avoid some mistakes. Reluctantly I agreed to participate – and I have to say she was totally correct! It gave us a lot to think about, a lot of ideas, a lot to strive for, and a continued association with Te Papa. It has made us look continually at how we look after the collection, the volunteers and the visitors. This association with Te Papa has continued and been very much appreciated for the advice, the new ideas, the help when needed, the interest in this project, the workshops, and the help with archival materials to house the collection. Through Council, land was made available. 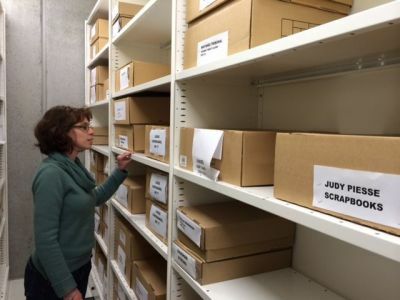 We approached Architectus of Auckland, who had designed the Anglican Archives under the Auckland Cathedral and therefore knew what was needed for good archival storage. They designed a building for us, but unfortunately with no visible presence on the ground it was very difficult to raise money. People said they would love to help, but was it really going to go ahead? The fundraising continued – it would have been very easy to have given up at this stage. Two members of a well-known local family made a very generous donation and that gave us the impetus to keep going. As a charitable trust we were unable to return donations. So if they saw this as a necessary project, we just had to keep going. 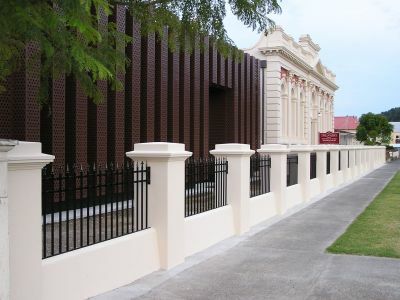 In 2007, Council made the decision to restore the old Carnegie Library which was being used by a community group and was in a sad state of disrepair. They then advertised for expressions of interest from the public. We heard about this with only a few days to go and the Trustees felt it would have been remiss not to consider this as an option. So we had a busy few days working with the architect to draw up an application they couldn’t turn down! The Trust was granted a renewable 30-year lease of the building and had a good enough collection to open to the public as soon as we moved in. Having a home made a huge difference to fundraising, and records started arriving on our doorstep, keeping us very busy. We enjoy working in this lovely old building and are pleased to be able to return it nearly to the purpose for which Andrew Carnegie donated money in 1905. We heard horror stories about people cleaning out their parent’s home and taking things to the dump or putting them on a fire. It had always been one of our goals to provide a heat, light and dust-controlled archive (to national standards) to store safely the things which couldn’t be replaced or were fragile. The property next door was secured, and Architectus redesigned an archive to be attached to the Carnegie Library. This in itself caused much discussion – a VERY modern building in the heritage end of Thames? Our only brief was that the Carnegie Library had to always stand out. We took their advice that the best way to do this was to build a very modern building beside it – and it works! Fundraising continued with urgency. We needed to raise a third of the total cost ourselves before we could apply to the funders. With this done, we had to time the funding applications. Some funders have one application a year, some three. Some let you know in a matter of weeks, some in three months. It required planning to get them all lined up so we knew we had all the funds in place at the right time. We had a great response from the funding agencies. While we didn’t always get the full amount we applied for, we reached our target and the Trustees made the decision to go ahead. In the meantime, the office could no longer be used as it was full of boxes of records waiting for an archive to go into. 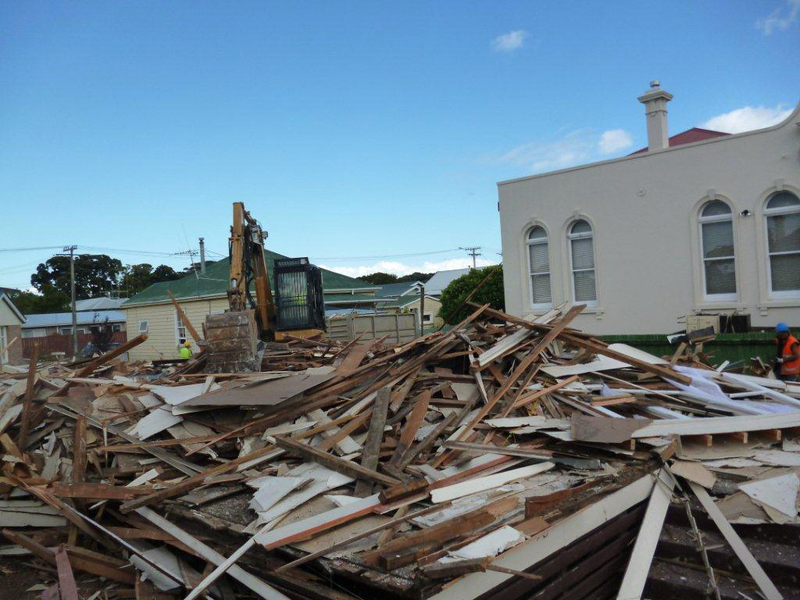 Building began in February 2013, only to be held up for 6 weeks by finding a Maori midden. We tried to use local material and contractors wherever possible. Although we hadn’t thought about it, this resulted in the contractors taking a personal interest in the job, and suggesting better ways of doing some things, the best possible prices, and in several cases giving us extra time helping with painting etc. Our chairman decided to manage the project thereby saving a lot of money. However it wasn’t without stress for him – the cladding we used only allowed for an overall tolerance of 5mm so he spent many hours measuring the building and calculating on the computer before putting in the order. Several members of the community offered to help wherever they could, clearing the site, erecting fences, painting, and planting. This also helped save money and allowed us to erect the fence across the front – something we thought we would have to reapply for funding to complete. There hadn’t been a fence there for many years, and we were keen to recreate the exact design that had been there in 1905. It was the finishing touch and the community love it. It has linked an elegant old building with a very modern one. The Trust’s one luxury has been to up-light the buildings for a few hours at night so the community can appreciate the old Carnegie Building which looks stunning. Although the modern addition still has one or two detractors, we also get cars screaming to a halt as they drive past, and people dashing in the get the name of the architect because they think the building is stunning. A local builder says he drives down to Queen Street, parks opposite the building and gazes at it – he thinks it should be the benchmark for all new buildings in Thames. Community support has been great to keep The Treasury functioning since we opened. 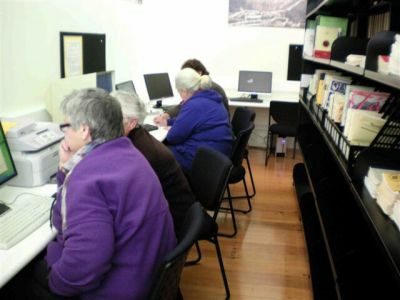 We have about 60 volunteer spots filled with indexing, oral histories, maintaining a busy website and online searchable database (www.thetreasury.org.nz), and we have three people on duty to help visitors every day we are open. (Monday, Thursday, Friday, Saturday 11am-3.00pm). What started out as simply keeping an eye on the collection is now much more complex and requires regular workshops to update and upskill people. It has developed a life of its own and we are very dependent on our wonderful volunteers to keep it going. We have a dedicated small group of ladies who since January have been fumigating and meticulously cleaning and listing all the records before they are taken into the archive. This has included about 5 tons of newspapers, another 100 boxes of newspapers which had been stored in ceilings and were filthy, business records from A & G Price (who haven’t thrown anything out since they established their foundry at the start of the Goldfield), and Battsons Plumbers (who have only just shut shop after being here since the very early days), organisations like Jaycees, now no longer in existence, family records, and photos. Visit The Coromandel website to find out more. The Treasury’s Oral History recorders. We receive no regular funding and are very reliant on grants for all the necessary folders and sleeves for the collection in the reading room, for furniture, and for archival storage material. There is a huge cost for insurance, for electricity for the archive (and we are looking at solar panels to reduce this), and we are currently looking at ways of getting a steady source of income which we can rely on. With two stages of The Treasury project finished – the reading room and the archive – we knew there was no room for complacency. We decided to hold a strategic planning workshop for members and non-members to look at what we need to concentrate on for the next 5 years. This produced some interesting ideas including the need to make more use of social networks and the internet. We oldies felt daunted by that. But the main item to show up was the need for a full time curator and receptionist – and we would still need the volunteers. We are desperate for this to happen – and I use the work ‘desperate’ deliberately. Several of us no longer have a life to call our own. We have been particularly fortunate in having a local lass, Nicole Thorburn, offering to volunteer with us part-time for six months. Nicole started volunteering with us over her summer holidays when she first left school, and while she was at university went on to work part time with the Waikato Museum for two years, then full time for about 18 months. She has completed a BA in History but her interest in archival work has seen her return to Thames to live at home while she completes a Diploma of Records and Information Management before heading overseas. Her offer was very timely – we had a huge backlog of records to fumigate, clean, accession and shelve in the archive. We also wanted to provide a wide experience for Nicole so she can see several different aspects of working in a community archive, so we have involved her in looking after incoming records, indexing, workshops, oral histories, and committee work until she leaves us next June. 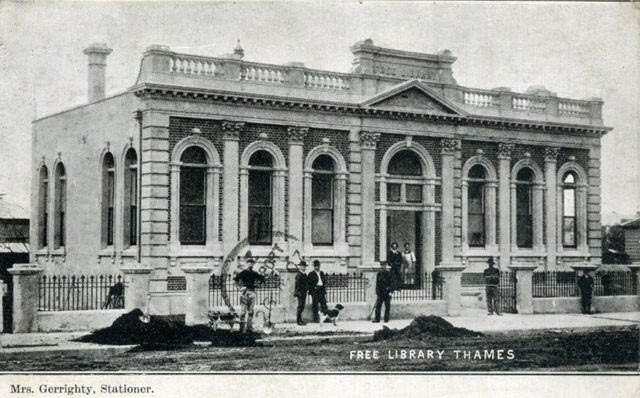 Our latest project is to compile a book – True Tales of Thames – following the idea started by the Coromandel Town History Research Group and taken up at Great Barrier. This is a great way of gathering the little stories – the ones which won’t make a history book. The Coromandel group are very keen to see this project taken up by New Zealand towns. The only criteria are that the Tales must be true, about the town in the name of the book, and be less than 1500 words. We have had such interest shown that the project has now become eight books covering the whole Hauraki Goldfield area. Readers with a tale to tell please contact geraldine.dunwoodie@gmail.com. Groups interested in doing the same in their area can also contact me and I will provide more information. This project has been an interesting journey for us all. I personally have learnt to write a business plan, make funding applications, write an expression of interest to lease, learn all sorts of new tricks on the computer, speak to groups (I’m shy), write publicity articles, speak on the radio, write policies – the list is neverending. We know this was an ambitious project to undertake, but our advice is to get a good group of people together and dream – if you don’t dream the dream, nothing will happen. Image credits: Images courtesy of The Treasury, Thames.